Envelopes are the natural companions of business and personal letters you will type up using Word 2013. Most of the time, when you print a letter, you also want an envelope for it. 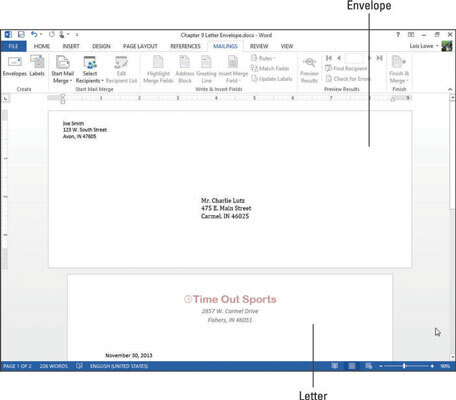 You can address the envelope by hand, of course, but printing an envelope is quick and easy in Word. One nice thing about the Envelopes feature in Word is that it can automatically extract the mailing address from the letter, so you don’t have to retype it. The Envelopes feature also stores your return address and recalls it for you each time you print an envelope. Open the a Word document with addresses. 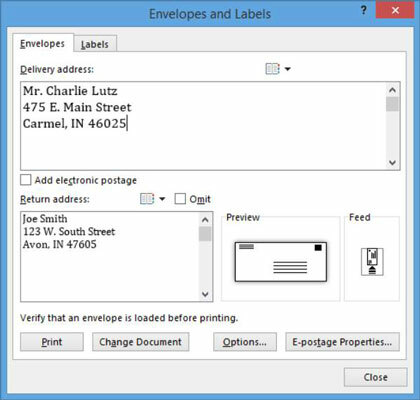 The Envelopes and Labels dialog box opens. Word attempts to fill in the correct address in the Delivery Address box, but in this case, it fails; it fills in the bulleted list instead of the mailing address. Select the recipient name and address in the letter (for this example, Mr. Charlie Lutz, 475 E. Main St., Carmel, IN 46025) and then choose Mailings→Envelopes again. This time Word fills in the address correctly. Type your own return address, or make one up, in the Return Address box, click Add to Document (or Change Document), and if prompted to save the return address as the default, click Yes. A new section is created at the beginning of the document, and the envelope is placed there. Notice in the example that the new section has a different paper size, orientation, and margins than the letter. There are many different shapes and sizes of envelopes, and Word can accommodate any of them. However, you must tell Word the dimensions of the envelope you’re using so that when you’re ready to print, Word can pass the correct size of your envelope to your printer. In your document, choose Mailings→Envelopes to reopen the Envelopes and Labels dialog box and then click the Options button. The Envelope Options dialog box opens. From the Envelope Size drop-down list, choose Monarch, and then click OK to return to the Envelopes and Labels dialog box. Click the Change Document button. The envelope size changes in the document. Using the same procedure as in Steps 1 through 3, change the envelope size to Size 10. 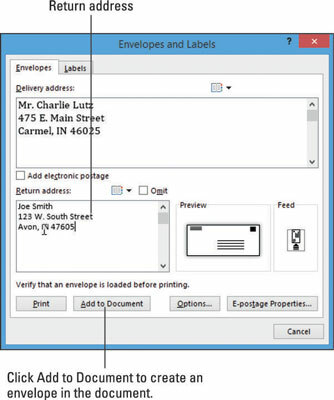 To print an envelope, feed an envelope into your printer and then print the section of the document that contains the envelope. You can either do this manually (by choosing File→Print and then selecting only page 1 to print) or you can reopen the Envelopes and Labels dialog box and print from there, in which case only the envelope (not the letter) prints. Choose Mailings→Envelopes to reopen the Envelopes and Labels dialog box. 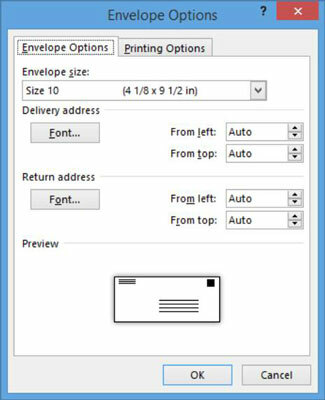 Feed an envelope into your printer and then click the Print button in the dialog box.